It’s a well known scientific fact that “healthy eating New Year’s Resolutions” only count on weekdays. Saturday is a grey area, but Sunday is when the fun really happens. Sunday is for feasting, chowing down, gorging, and treating yourself. All safe in the knowledge that calories don’t count because it’s the weekend, duh! Anyway, tenuous scientific research aside, I have a filthy little treat that you are going to love. 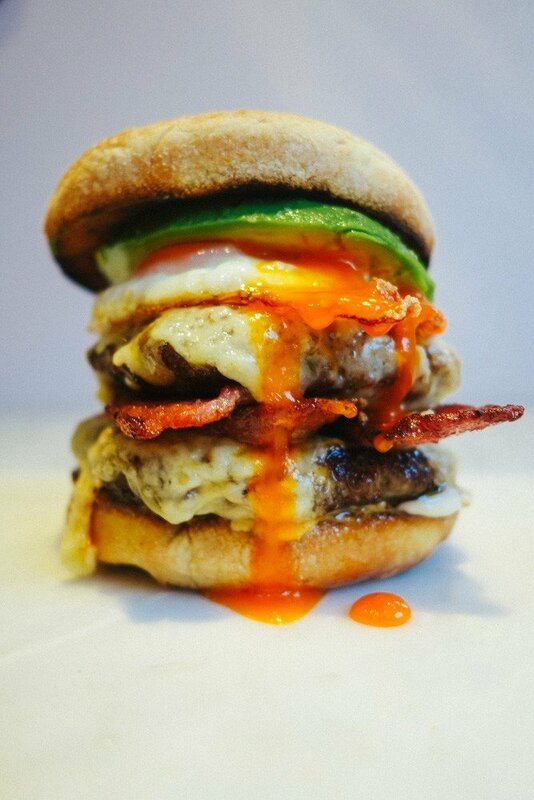 A doubled up cheeseburger with bacon, egg, avocado, a toasted English muffin (c’mon I am The Londoner after all), hot sauce. Basically all the best bits of brunch, all in one double handful. Make sure you have the ingredients on hand this weekend and knock one up. You’ll love me forever, I promise. *When it comes to beef burgers, you’re best off asking a local butcher to mince these up for you. If all you can get is the pre-packaged type, try and get the best available or they’ll be full of salt and additives. How ever you get your patties, just before cooking sprinkle with fresh black pepper, lay over a piece of baking parchment and flatten the patties out with the palm of your hand. They want to be about half an inch thick all over. Heat a frying pan over a medium-high heat. When it’s hot, add your burgers. Cook until brown and delicious on both sides. While you’re waiting, put your grill (broiler) onto a medium-low heat to warm up. Once the burgers are cooked, place your sliced cheese on top and place them under the grill. You can slice open your muffin and add that to the tray to toast, too. Cook your bacon in the burger pan, while the cheese slowly melts under the grill. Once the bacon’s almost done, fry an egg in the same pan. Slice up your avocado. Pull your toasted muffin out and smear with a layer of mustard and a dollop of mayonnaise. Add a delicious layer of crispy bacon. Sprinkle with hot sauce (or ketchup if you’d rather). 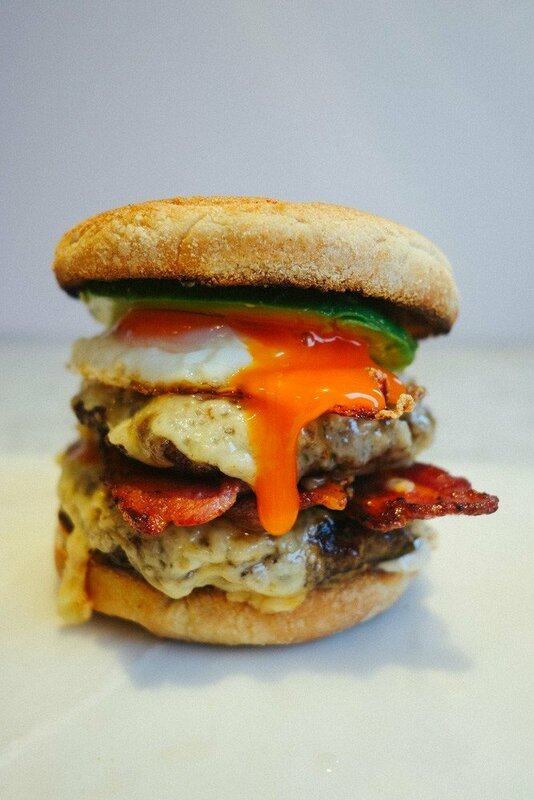 Top with your fried egg. Crown with avocado and toasty muffin. Take a step back to admire your handiwork. This ain’t no McMuffin, yo! This is a breakfast fit for Kings and Queens. A ludicrously perfect brunch. The ultimate balance of flavours, textures and wickedness. Just what every Sunday deserves. I’m going to be bold and say it’s the best burger you’ve tried all year.